Roasted Chicken Leg Quarters is a dish that is economical to make, and it tastes like you spent hours on this dish. This dish is perfect for when you are running out of a paycheck, or even went you want something that will remind you of comfort food. 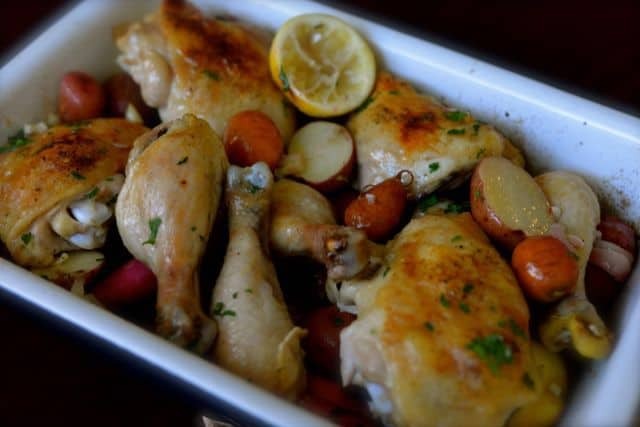 I love to roast chicken leg quarters, they are so easy to prepare. You can put prepare these in just about an hour. You can roast these with a variety of vegetables, here I have roasted these with red potatoes, garlic, carrots, radishes, lemon, and I added a little fresh rosemary. You can use anything root vegetables that you have on hand. Looking for more great weeknight chicken recipes? Roasted Chicken Leg Quarters is an inexpensive dinner to make. Cut potatoes into quarters and place in a bowl. Place cut carrots and radishes into the bowl. Place chopped garlic into a bowl. Zest lemon and juice the lemon placing the zest and lemon juice into a bowl. Coarsely chop fresh rosemary and place over the vegetables. Drizzle olive oil over vegetables and mix to coat vegetables evenly. Season vegetables with salt and pepper. Pour vegetables into a 9 by 13-inch pan. Spread out vegetables into a single layer. Cover pan with foil and bake for approximately 30 minutes. If desired spread softened butter under the chicken skin, and then spread a light layer of butter on the outside of the chicken skin. Season buttered chicken with salt and pepper. Remove vegetables from oven, remove the foil, and place the chicken over the vegetables skin side up. Roast chicken for approximately 30 minutes or until done. Chicken is done when it is pierced and the juices run clear. Can i just use my red potatoes And season and ok oil because that’s all i have on hand right now? Because this sounds great!!!! It’s in the oven! And the fresh herbs I can smell already! I am going to try this for dinner tonight. It sounds really amazing. This sounds really good. I am going to go and try it now! I hope you enjoy this recipe. Let me know how it turns out for you.